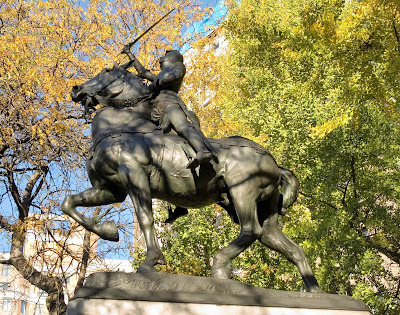 Ready to charge across the Hudson River, an equestrian statue of Joan of Arc overlooks Riverside Park on the west side of Manhattan. It arose in December 1915, six years after two energetic men – a distinguished mineralogist and jewelry company executive and a patron of the arts – set out to honor the French saint in New York City. 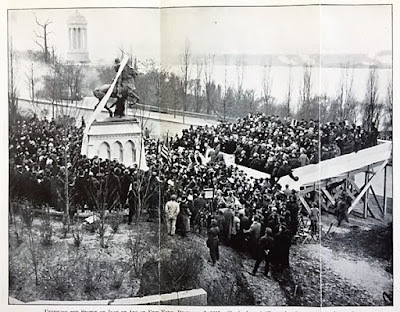 The 20-foot high bronze statue, atop a granite pedestal, has never been a major attraction. Admirers always note, however, that it is the work of a woman sculptor, Anna Vaughan Hyatt. Her sculptures also show up at the Bronx Zoo and Columbia University, among other places. 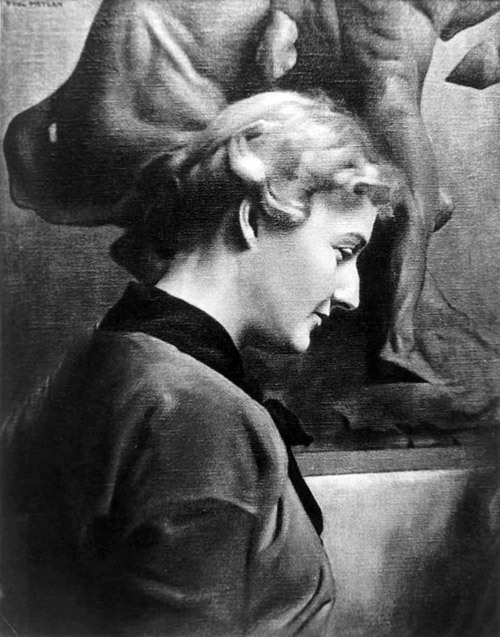 Anna studied at the Art Students League under Gustav Borglum, who created Mount Rushmore. In 1909, she entered a plaster cast of a statue of Joan of Arc in the 1910 Paris Salon, where it received an honorable mention. Subsequently, Hyatt would sculpt Joan in bronze for the New York City memorial. Joan of Arc had been gone for several centuries when she came back into vogue. During the late nineteenth century, thousands of French citizens began to make pilgrimages to her birthplace and new statues of her were erected in towns across France. The reason for the excitement was the Church’s decision to beatify her in a series of ceremonies at St. Peter’s in Rome in April 1909. More than 30,000 French pilgrims, dozens of French cardinals and bishops, and all kinds of “notables” attended. In the U. S., George Frederick Kunz, a mineralogist and former vice president of Tiffany & Co., and J. Sanford Saltus, a philanthropist and the heir to a steel fortune, decided that New York City should honor the new saint. Both men revered French painting and sculpture, were recipients of the Legion of Honor, and felt a strong affinity with the people of France. 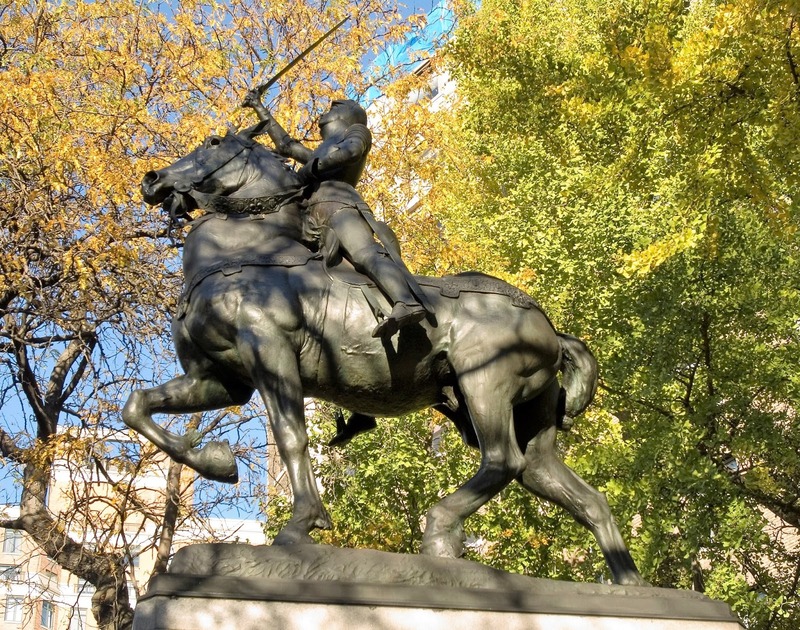 They co-founded the Joan of Arc Statue Committee in 1910. 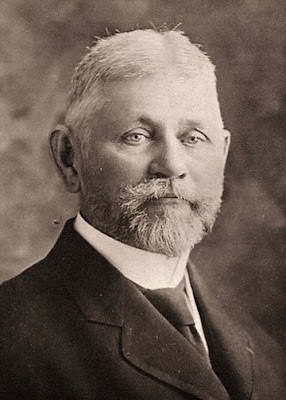 Within three years, Kunz – who was the real driver – had raised $20,000 for the construction of a statue. We are beginning to realize more and more that New York is the most wonderful city in the world and the monument must be an ornament to it. As long as it is what it should be we do not care who makes it, a Russian, an Italian, an American, or a Hottentot. Meanwhile, Anna Hyatt had already started to work on the statue, using her niece as a model for the figure. Kunz turned his attention to the pedestal. The man had traveled the world in search of rocks, gems, opalized wood, meteoric iron and the like. He was passionate about stone and hoped to use it to infuse the monument with meaning. For this reason, the granite pedestal contains stones from the castle at Rouen where Joan of Arc was imprisoned; from the cathedral at Reims where Joan watched the coronation of Charles VII in 1429; from Domremy, the village where Joan was born; and from the city of Orleans, where Joan led French forces to victory during the Hundred Years’ War. Soldiers' and Sailors' Monument in left distance. It was Kunz’s idea, as well, to bury a copper box inside the pedestal. The box contained mementoes of the era, including American and French currency, commemorative medals, and more than a dozen letters and speeches including salutations from President Wilson. Lastly, a specimen of Staurolite, also known as “fairy stone,” went into the box. 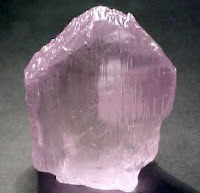 The crystal symbolized the tears shed for Joan of Arc, Kunz explained. In December 1915, Jean J. Jusserand, French ambassador to the U.S., dedicated the statue. By this time, of course, the Great War had started and Jusserand’s message of fighting to the death held both poignancy and urgency. Dr. Kunz (as he liked to be called) had launched his career in 1876 when he sold a spectacular tourmaline to Charles Lewis Tiffany. Kunz would serve as Tiffany’s chief gemologist for the rest of his life, discovering and analyzing gorgeous, exotic stones. The crystal known as Kunzite was named in his honor after he identified it in the Connecticut countryside in 1902. After the death of Kunz’s first wife, he waited ten years before remarrying a young woman aviator. It’s kind of funny that her name was Opal. *A highly abbreviated account. She also was charged as a cross-dresser.